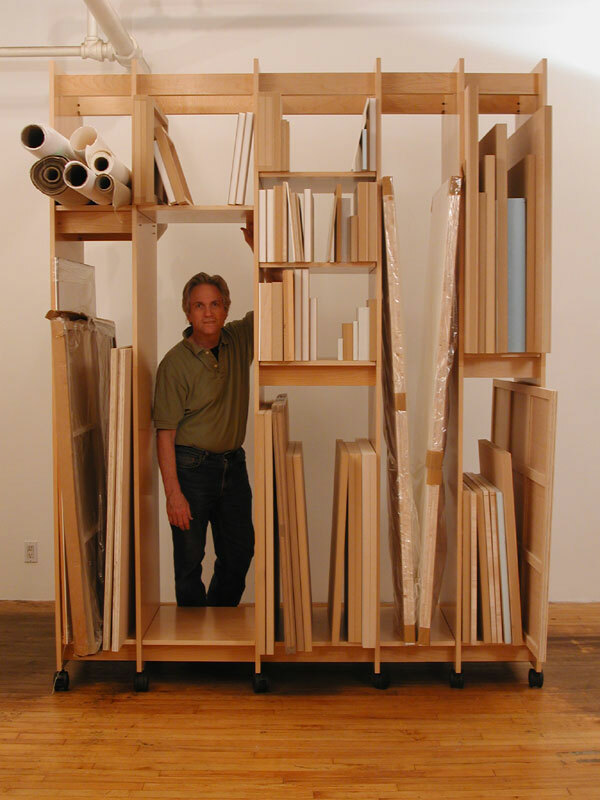 Art Storage System made for artists, galleries, museums, and art collectors. Art Storage System 13.50" wide. can be added at any time. Additional Art Storage parts can be ordered at any time. To price additional parts enter all shelves, rails, and walls, into the chart below. The Art Storage System is made and shipped from Brooklyn NY. For shipping quotes and and questions please call Art Boards™ 800 546 7985. Art Boards™ modular system for storing art is flexible. It will fit into any space or situation. Art Storage sections & parts can be added at any time. Art Storage Shelves adjust in height. Art Storage rolls on wheels that lock in place. Art Boards™ Archival Art Supply. 13.50" wide, 99" tall, 23.75" deep. For more details and photos click: Art Storage System.